It’s cherry season! This is the time of year to prepare for those long cold winter nights, where a good Manhattan in front of a roaring fire is the only thing that gets you through until spring. As I have mentioned before, those bright red candies in a jar are an abomination that have no business being part of a fine cocktail (with one notable exception). I know that there are other options out there, but they can be expensive and difficult to find, so my recommendation to you is make your own! Not only are they very simple to make, your friends will be very impressed. So head to the nearest farmers market or fruit stand and pick up a few pounds of cherries and get started! 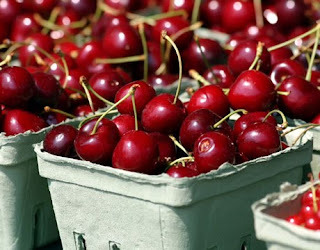 Start by stemming, pitting and washing three pounds of dark sweet cherries and set them aside. Pour one half cup of sugar into a large saucepan (I am going to try pure cane sugar this year, but in the past I have used just plain sugar), add a half cup of water, an ounce of lemon juice and two cinnamon sticks. Bring the mixture to a boil and reduce the heat to low add the cherries and simmer for five minutes. Remove the pan from the heat and stir in five ounces of the alcohol of your choice. I use bourbon since most of the drinks I use the cherries in are bourbon based, but brandy, scotch or rum would all impart slightly different flavors, feel free to experiment. Let the mixture cool before placing the entire mixture in a jar. Store these in the fridge and they will last all winter long. This recipe can be halved or doubled depending on your rate of consumption. Also, in a pinch frozen cherries can be used. Stem, pit and wash the cherries. Heat the sugar, water, lemon juice and cinnamon sticks to a boil in a large saucepan. Add the cherries and let simmer for five minutes. Remove the pan from heat and stir in the bourbon. Let mixture cool completely before placing it in a jar and refrigerating.